The Indianapolis Police Academy successfully tested CrossFit methods on recruits, and now a CrossFit training program has been implemented for all 1,600 police officers. Nathan Barlow and Vincent Cascella explain how they beat bureaucracy to produce fitter cops. 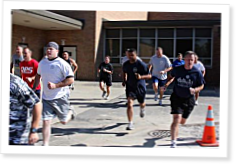 In January 2009, the Indianapolis Metropolitan Police Academy conducted an experiment: how would full CrossFit implementation affect the quality of recruit physical fitness test scores compared to the traditional model? Sgt. Nathan Barlow, a Level 1 CrossFit trainer and member of the academy staff, took it upon himself to conduct the experiment despite the fact that he lacked funding, sufficient staffing and even mediocre equipment. What Barlow did have, however, was a powerful belief in the proven efficacy of CrossFit program, and he was certain CrossFit could improve fitness within the agency at the entry level. Over the course of six months, the 5th Recruit Class gathered in our small gym and at our outdoor track to learn the nine essential movements, the concepts of progression and intensity, and what a properly fed athlete looks like. Just prior to graduation, astonishing results—which are also typical of the CrossFit program—were realized: dramatically improved exit-standard scores with less time invested and zero PT-related injuries. This is the story of large-scale CrossFit implementation within a major metropolitan government bureaucracy. The findings that you document are what has come to be routine in the CrossFit world, and my compliments for an outstanding job of preparation and presentation. However, the biggest benefit that all the participants will see is being more prepared to fill their respective roles as first responders! Kudos to Nathan and Vincent on a job very well done! Thanks to Lt. Cascella and Sgt Barlow for getting Crossfit started at IMPD. I know as part of the original On-Ramp program that it has changed my life. Hopefully our program will serve as an example for other agencies to follow. I just recently attained my Level 1 Cert. I am trying to do the very same thing that these officers did by implementing CrossFit into my unit's PT program. Congrats to IMPD for jumping in. Great insight into the struggles facing official adoption of CF into our services. Thanks for sharing. I am waiting to attend my level 1 Cert in April in St. Paul. Then i plan on starting on a company level with implementing Crossfit at my Station. Great job on recording and producing some figures that demonstrate the improvement in performance! I agree this will help the decision makers make the right decision!